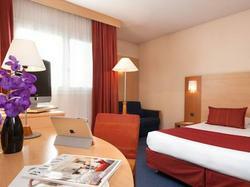 This hotel is located 13 km from central Paris and less than 10 km from Versailles. It offers rooms with minibars, free Wi-Fi internet access and satellite TV. Guests at the Forest Hill Meudon Velizy have free access to the Forest Hill Meudon Club, which includes an outdoor swimming pool, tennis and squash courts, and a fitness centre. Guests can enjoy a meal at the hotel's restaurant, the Hippopotamus, or relax with a cocktail at the Central Bar. The Forest Hill Meudon Velizy has a 24-hour reception, which is hosted by a multilingual team. Free parking is also available. This air-conditioned room features free Wi-Fi access, a private bathroom and satellite TV. Additional facilities include a minibar.